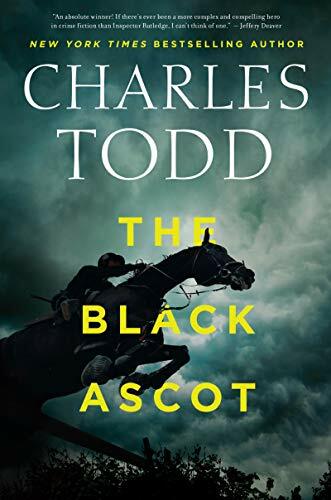 Charles Todd’s Inspector Ian Rutledge series opens its 21st title with a tip of the hat to a 1910 event well known in England, but perhaps not to American readers: the “Black Ascot,” when the traditional glittering social occasion of the royally established horse race faced a catastrophe of timing. King Edward VII died, and the royal house was in deep mourning, with the nation hardly less so. In a brilliant adaptation, the “glitterati” attended in mourning dress: clad entirely in black. In a death related to the race are the seeds of the tragedy and linked crimes than Inspector Ian Rutledge finds himself investigating 11 years later, in his postwar resumed post with Scotland Yard. Not that the case is obvious to start with—in fact, Rutledge simply responds to a village crisis, an overwrought man on a church roof, holding a girl hostage with a shotgun. Fans of the series will give a quiet “hoorah” for the immediate presence of Rutledge’s haunting inner voice, that of his wartime colleague Hamish, warning Ian of the perils in the rescue he attempts. There’s an unexpected gift to Rutledge when he resolves things: word of an observation of a “most wanted” murderer from that 1910 event, Alan Barrington. “Rutledge made good time back to London. And for most of the drive, he mulled over Danny’s sighting of Alan Barrington, and whether or not to mention it to Chief Superintendent Jameson. . . . If the sighting proved true, and the Yard wasn’t informed then he would be derelict in his duty. Of course, since the Chief Superintendent heartily despises Rutledge, the hunt for a near-vanished deadly criminal is also a possible way to humiliate the inspector with that wild goose chase, and possibly even to fire him. So the hunt is on. Charles Todd is a master plot tangler, and in the hands of this mother-son author team, Rutledge must comb apart society’s powerful connections, apparent love matches that turn abusive, and more. Because he’s hunting Alan Barrington, he’s pitting his wits and emotional understanding against some passionate defenders of the accused—people who will do almost anything to prevent Barrington’s capture and trial. He’ll also pry into a family’s desperate efforts to protect an outcast and a hidden set of long-ago crimes. The enduring appeal of this series is its subtle and poignant probing of the damage done by the Great War: to Ian Rutledge, to England’s upper classes and villages alike, and to a nation’s concept of itself as gracious and lovely. At front and center this time is not the struggle between Ian and the part of himself that speaks with Hamish’s voice. Instead, it’s the taint of a shell-shock diagnosis, something considered so offensive and humiliating in postwar society that it can terminate Rutledge’s career almost as quickly as a bullet to the head. So solving the Barrington case and capturing the killer becomes Rutledge’s only hope for his self-respect and his job. As the pages fly past, Charles Todd takes this investigator into tangled boundaries and razor-sharp fences. The best kind of suspense is generated: believing that somehow the inspector will come through, but not knowing, from one moment to the next, how on earth he and his fragile network of support will find a way out of the war-torn darkness.